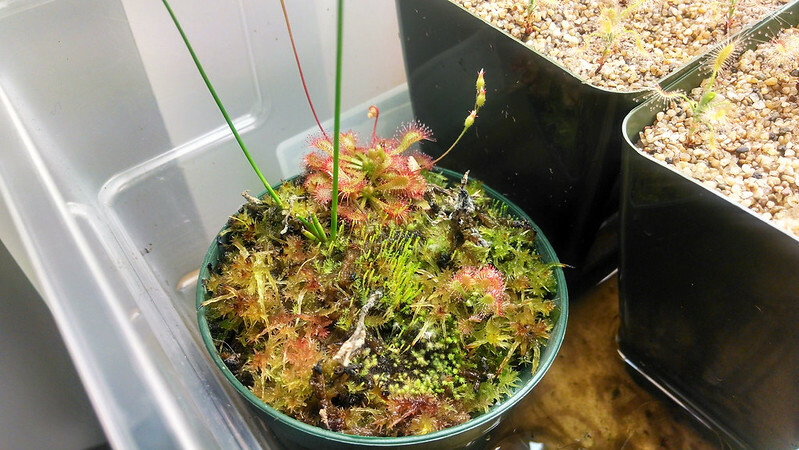 Chores falling by the wayside |Sundews Etc. I started collecting carnivores this last autumn, and really got into it in the dead of winter. This meant I had a lot of time to spend with my plants, since I work in a restaurant and January/February is the slowest part of the year. Also I had fewer plants back then. Alas, now I have lots to do in my collection and less time than ever to do it in. One of the things I really need to do soon is pot up the Drosera 'Marston Dragon' flower stalk cuttings I mentioned in the last post. They're even more well-developed now, but I couldn't get a good picture today. There's also plenty other chores that are just not being addressed. For example, I have a couple pots I really need to separate out. 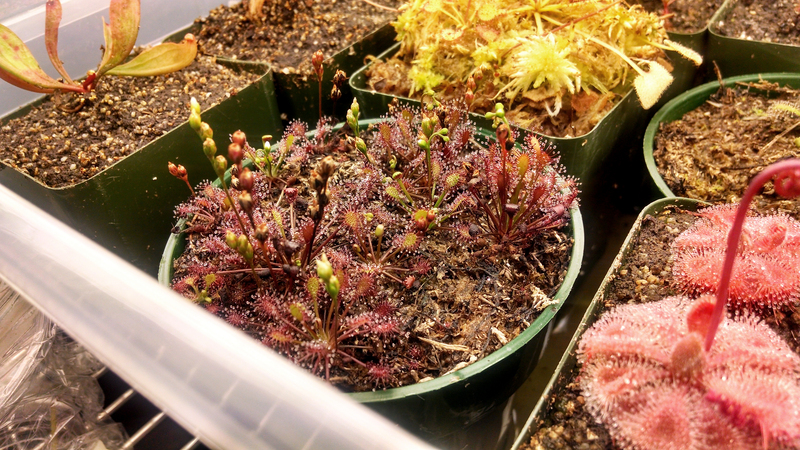 These Drosera intermedia 'Cuba' plants could probably get much bigger with enough room to grow. 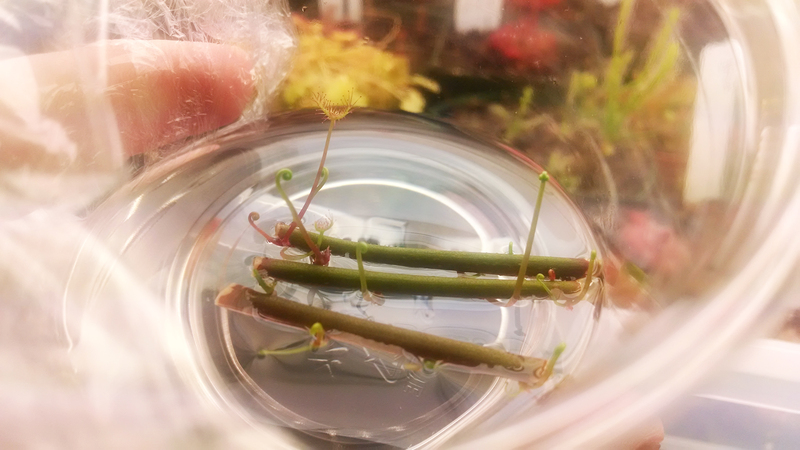 I've been thinking about separating this clump of Drosera capillaris out for months. I also need to get these pygmies into bigger pots before their roots get too unruly. 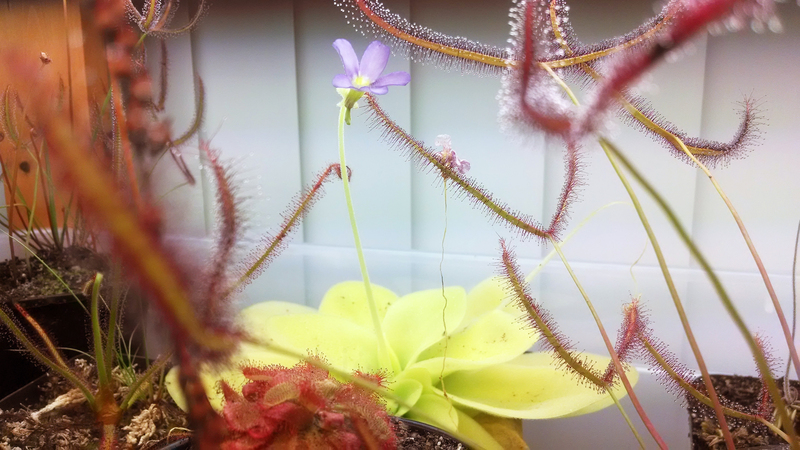 My Drosera dichrosepala and Drosera allantostigma are both flowering. D. helodes just finished, and D. pygmaea is sort of just hanging on. 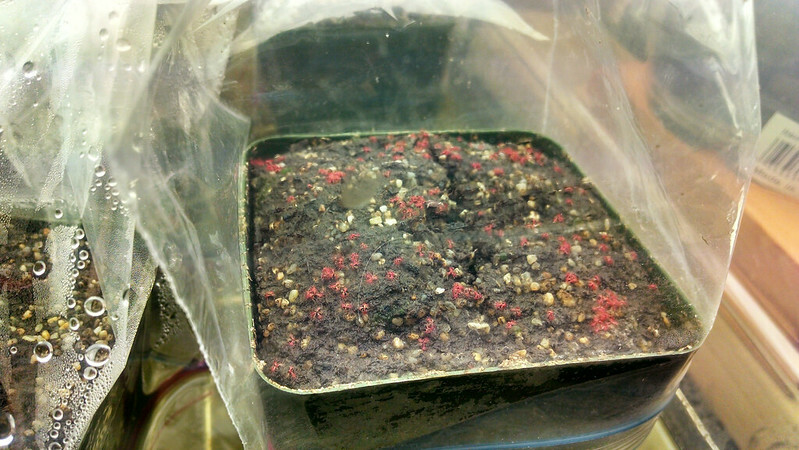 I started hardening off these Drosera natalensis seedlings weeks ago, and once I finish I can start feeding them for serious growth. I just can't find my scissors. Tiny baby Drosera natalensis look super red. A good sign! This Pinguicula gigantea flower won't pollinate itself you know (alas). This is now the fourth P. gigantea flower. I really need to pollinate one. 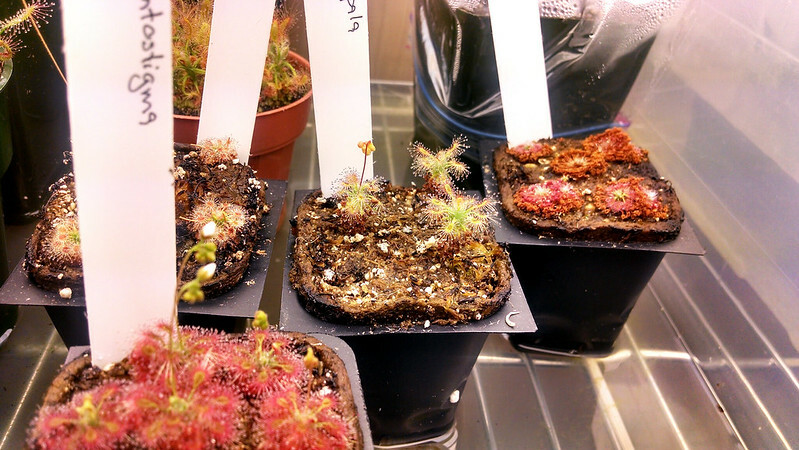 Cleaning the old food off these Drosera brevifolia would be trivial, but somehow it hasn't gotten done. From now on these guys are getting the powdered food only treatment. 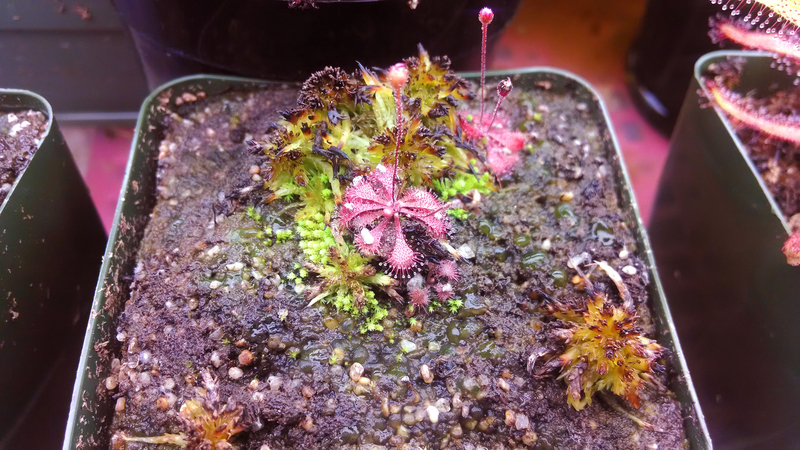 I don't even know what to do with this Drosera capensis window-box thing. 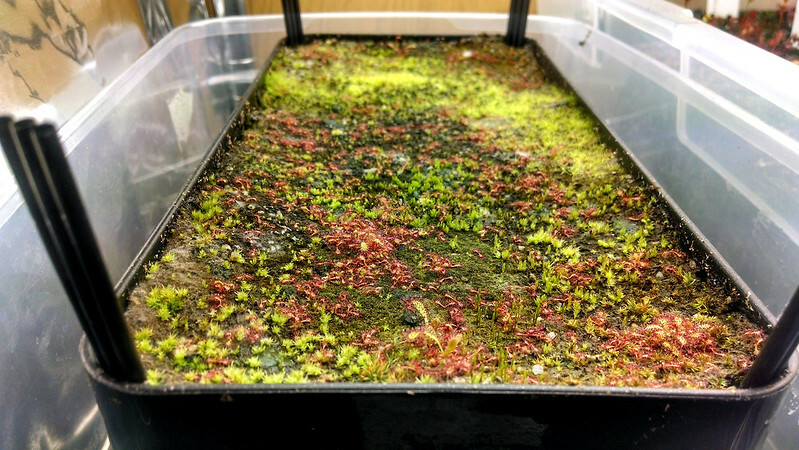 Weed out the moss with tweezers? Feed the plantlets? Probably. There are a couple plants in here that could totally explode in a couple weeks if fed heavily. And don't even get me started on this weird little Drosera spatuhaha (get it?) that is in a small pot with weeds and long roots and it's flowering oh god. 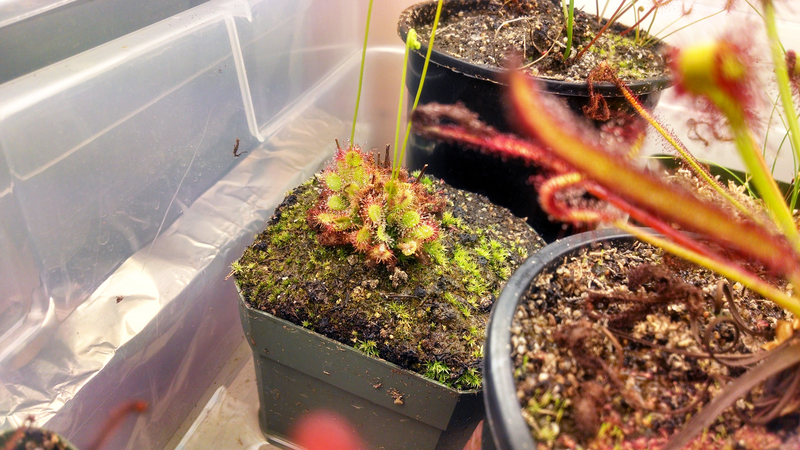 This is a descendent of one of one of the sundews from this post, pictured with my dormant VTF. It's been doing pretty well with almost total neglect. I am given to understand that having lots of plant chores is normal, but I'd really like to have a couple days in a row to take care of all of this business. Ah well. I guess life goes on. Even in a collection of weird plants.